A battered wife romance thriller, Sleeping With The Enemy carries the distinctive stink of a bad made-for-television production masquerading as a serious film. 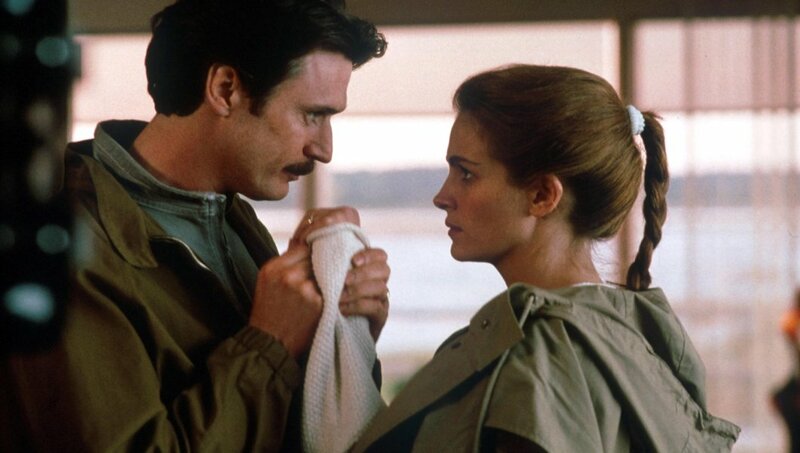 Laura (Julia Roberts) is married to wealthy investment advisor Martin (Patrick Bergin), and they live in a gorgeous Cape Cod beachfront house. Martin is a possessive control freak who does not hesitate to physically abuse Laura, before showering her with gifts the next day. Fed up, Laura plots an escape involving faking her own drowning death when the couple take a sailing trip. Laura assumes a new identity and settles in Iowa near the care home where her elderly mother lives. Soon she meets and starts a relationship with dishy next-door neighbour Ben (Kevin Anderson), a college drama teacher. But Martin soon connects the dots, uncovers Laura's deception, and comes looking for his wife with revenge on his mind. One of Julia Roberts' worst early career missteps, Sleeping With The Enemy is burdened with an atrocious script, over-the-top acting, and bland, paint-by-numbers execution. Written with plastic dialogue by Ronald Bass as an adaptation of a Nancy Price novel and directed without emotion by Joseph Ruben, the film never rises above the easily calculable. Banal, bland and eye-rollingly vanilla, Sleeping With The Enemy has no appetite to delve into any of the issues it purports to tackle. The physical abuse dished out by Martin is reduced to two blows, and Roberts' looks are never compromised in the name of authenticity. The romance with Ben is immediate and unobstructed, complete with nauseating meet-cute moments involving his impromptu dancing with a water hose and her stealing his apples. There is a stultifying montage sequence to the tune of Brown Eyed Girl as Roberts tries on numerous wigs, hats and dresses in Ben's company, the producers clumsily reaching for a Pretty Woman shopping moment and failing miserably. None of the characters are afforded any depth, with Bergin sinking into bug-eyed madness as the aggressor Martin and Anderson wallowing in doe-eyed long-haired lover territory as the dreamy and all-too-perfect Ben. Roberts is much better than the material, but Ruben is so clearly smitten by his star that his directing defaults to training the cameras on her and standing back in admiration. Sleeping With The Enemy does not even manage to be trashy fun: it's just inept. Sleeping with the enemy could be mistaken as a lifetime movie, because that's what it is. Amateur, cheap and condescending also. Yes, I think Roberts' fame is the only reason this one made it to the big screen. as you said, she is the best thing about it, but the material doesn't do her talents justice. and again, she's a great actress but some of her movie choices baffle me.